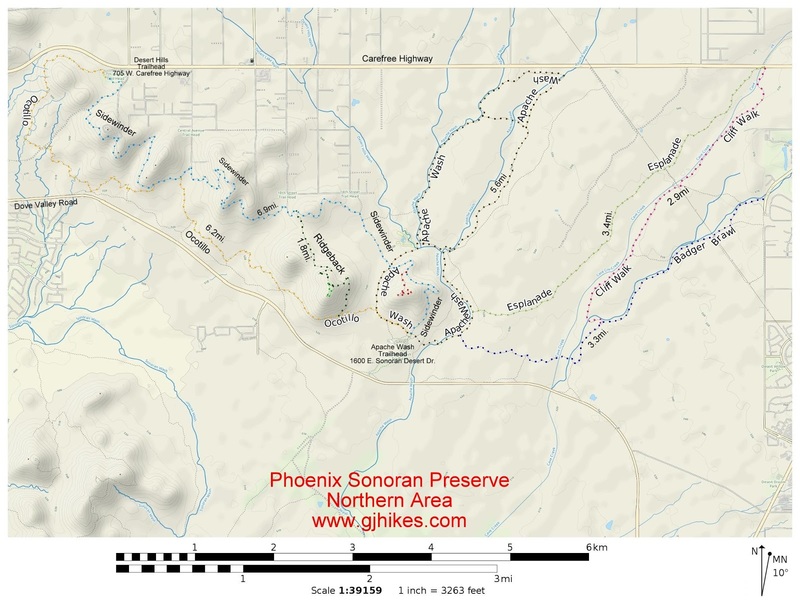 The Sidewinder trail is located in the northern area of the Sonoran Preserve in Phoenix, Arizona. The trail stretches for almost 7 miles between the Desert Hills and Apache Wash trailheads.Sidewinder can be combined with the Ocotillo trail to create one long 13 mile loop or a shorter 5 mile loop if beginning at the Desert Hills trailhead and a 7.4 mile loop if starting from the Apache Wash trailhead. This post begins at he Desert Hills trailhead which is at 705 W. Carefree Highway. 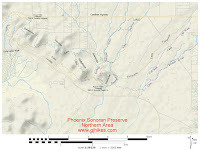 The Apache Wash trailhead is at 1600 E. Sonoran Desert Drive. From the trailhead the route heads up to a saddle in the ridge where it climbs on a moderate slope around to the opposite side of the mountain below a radio tower. All the ups and downs of the Sidewinder trail become apparent while looking at its elevation profile. Going from the Desert Vista to the Apache Wash trailhead there is a total of 1,120 feet of climbing elevation. From there the trail races around the south side of the mountains where you can look down at the Ocotillo trail that is skirting around the base of the foothills below. Right around the 2 mile point the Sidewinder and Ocotillo trails meet up and share routes for the next quarter mile. This is where one of the options for a shorter loop comes up. Just past the 2.5 mile point the Sidewinder trail starts its longest climb that leads up to its highest point of elevation. For the most part the climb is stretched out along a moderate slope with only a few short steeper sections. After a long descent into the valley the Sidewinder trail continues eastward and passes a junction with the Ridgeback trail at the 4.5 mile point from the Desert Hills trailhead. While crossing the valley floor the trail passes a connector that runs over to the Apache Wash Loop. As the trail approaches a saddle in the ridge it crosses the Apache Wash Loop at the 5.7 mile point and begins a climbing traverse that takes it around the backside of the next hill. The gentle climb around the mountain takes the Sidewinder trail past a junction with the Apache Vista trail at the 6 mile point. The sun was getting low in the sky and the temperature was cooling of enough for a rattlesnake to venture out from wherever it had been spending its day. We stopped and watched, of course, as it rattled its way across the trail. The Sidewinder trail meets back up with the Apache Wash Loop and Ocotillo trails as it comes to an end at the Apache Wash trailhead. On the day that we took the photos for this post we actually began at this spot and rode the Ocotillo trail over to the Desert Hills trailhead before coming back on the Sidewinder trail. One of the best features of the Sidewinder trail is that it isn't nearly as rocky as many of the other Phoenix Mountain trails. If you would like to see it for yourself then all you have to do is grab your bike or 'Take a hike'.